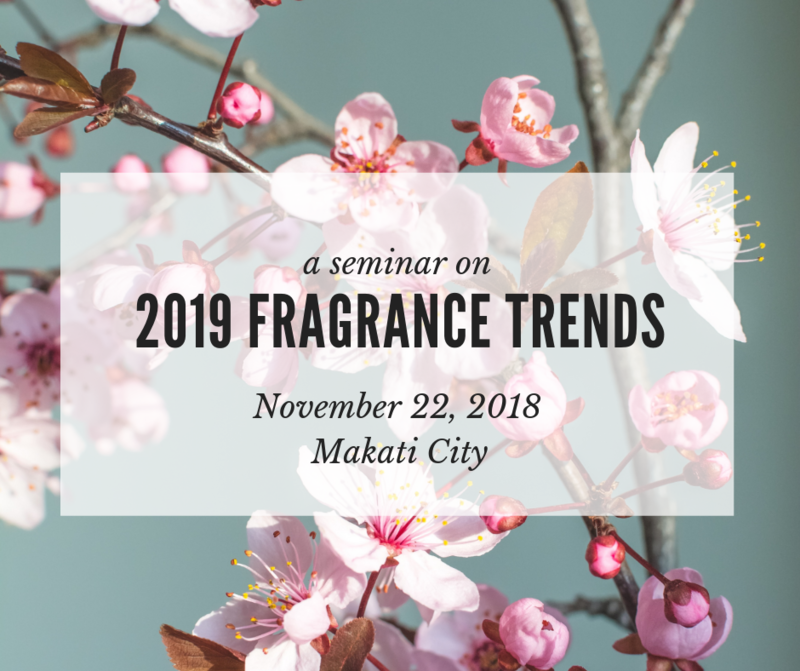 Our perfumer and founder, Bernadette, will be conducting a 2019 Fragrance Trends seminar this coming November 22. If you’re making perfumes, colognes, soaps, personal care products, hair care products, home fragrances and even cosmetics, this is a seminar for you! We’ll be discussing global as well as trends in the Philippines. Bernadette is a Certified Fragrance Specialist, a professional Perfumer and co-founder of BC Fragrance and Scentful Living. She has created bespoke fragrances for brands and properties like SM Supermalls, Ford, Mercure Hotels, Ortigas & Company, Giordano, Freego and more! In 2015, she was the youngest member of Board of Trustees of the Chamber of Cosmetics Industries of the Philippines (CCIP), the leading organization for cosmetics-related business in the Philippines. She conducts basic fragrance knowledge workshops called Fragrance101 once a month. Please note that the workshops involve the use of perfumery ingredients, those with allergies and sensitivities are advised to take this into consideration. Read our health and safety points. We highly discourage pregnant women from joining the classes. We smell potent materials during class and may cause nausea, or worse, premature contractions. We suggest consulting your doctor prior to attending our classes. Please note that the fragrances created during a workshop are for personal use only and not for commercial purposes. Our workshops are for recreational and educational purposes and we do not provide business advise during these sessions. If you’d like to learn more about our fragrance development and consultancy services for brands and businesses visit the Fragrance Development Services page. Light refreshments, coffee, tea and light snacks are served during the workshop.